If there's one thing I feel when I watch the Olympics, it's a sense of pure inspiration. Obviously, I'll never get to the skill level that these trained athletes have gotten to in order to make it to the Olympics, but that doesn't mean that I don't feel compelled to hit the gym just a little more often during Olympic season. Color me surprised, though, when a pair of Olympic athletes have not only achieved all of my athletic aspirations, but my relationship goals as well. Brianne Theisen-Eaton and her husband Ashton Eaton are both world-class runners and competitors in the 2016 Olympics, though the couple is competing for different teams: Theisen-Eaton took home the bronze medal in the heptathlon for Canada, while her husband Eaton is representing Team USA in the decathlon. Though they play for different teams, though, the couple does have one thing that is just their own: their brand, appropriately titled Eaton. 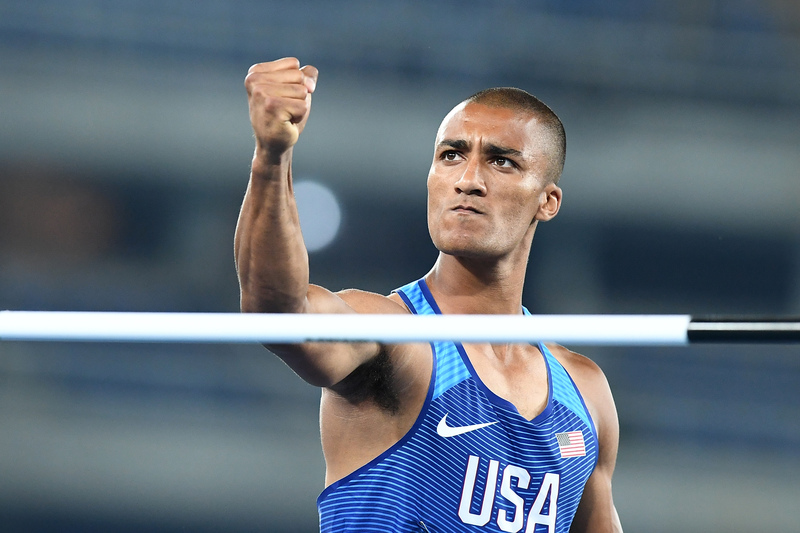 Eaton is a lifestyle brand created by professional athletes Ashton Eaton and Brianne Theisen-Eaton, a husband-and-wife duo known as world-class champions of the decathlon and heptathlon. Established in 2015, Eaton advocates becoming the most remarkable version of yourself. Eaton cultivates a real and relentlessly focused community of doers through active engagement and outreach. If you click around the site, Eaton provides you with chronicles of the married athletes' journeys during the Olympic season, information about their backgrounds, and photos from the couple's life — many of which can also be found on Eaton's official Instagram page. One thing that Eaton has done since its launch is the #WhatsYourGold competition. This storytelling competition "encourages people to embrace their imperfect journeys to reaching personal goals." The couple provided the person who best explained their "imperfect" story with two tickets to the 2016 Olympics in Rio. The winner of the competition was announced nine weeks ago on the Eaton Instagram page. Now that the Olympics are coming to a close, it seems that these athletes can continue to work on building their brand, which involves both sharing their own stories as well as helping other people achieve their own goals.